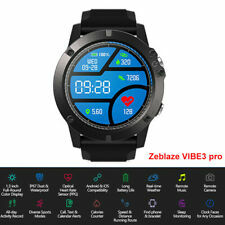 Zeblaze Vibe 3 pro Smartwatch Waterproof BT-4.0 Heart Rate Sports Smart watch for Android 4.4 / iOS. Compatible OS :Android 4.4 or above, iOS 8.0 or above. Bluetooth Version :BT 4.0 or above. Model : VIBE 3 Pro. Experience hands-free freedom with the Samsung Galaxy Watch. Receive intuitive reminders when it matters most, and keep your Galaxy Watch in view on its wireless charging stand. As individual as you are. Xiaomi Mi band 3 Smart Wristband OLED Display 50M Waterproof Heart Rate Monitor Bracelet. This is Chinese Version Xiaomi Band 3. 1 Refurbished Xiaomi Band 3 Dark Blue. Type: OLED Touch Display. Raise Wrist To Wake Up The Screen. It also monitors your stress levels to assist you with reduction through guided breathing. Match Galaxy Watch to your lifestyle with an authenticity you can see through a variety of watch faces and with depth and lighting effect. Samsung Galaxy SMR-800 46mm Smartwatch- Silver. OVERVIEW When you can receive notifications and calls right on your wrist with Samsung Galaxy Watch, you’re always connected. Whether you’re cycling, swimming, squatting or sleeping, the Samsung Galaxy Watch automatically detects and monitors your activity. Why Use ID115 Plus Smart Bracelet?. ID115 Plus detects common activities such as walking, running, bike riding and other exercises automatically. To help you live a healthier life, the wristband will remind you whether you’re sitting too long and urge you to exercise. Hi, we are lemfo from China. Our main products are phone cases. (Not included the Chinese Festival, such as the Spring Festival, hope you can understand.). Support Android 4.4 & iOS8.0 or above. Bluetooth speakers, smart watches, etc. Heart rate, ECG, blood pressure, blood oxygen. Sleep monitoring, sedentary reminder, drinking reminder, information notification. Bluetooth : 4.2. Altitude, air pressure, UV, weather (push through the network).